Blue Garter » Blog Archive » It’s July! Never mind that it’s 59 degrees F and raining. The calendar says it’s July (and my husband has been wearing shorts out of sheer stubbornness), and if you’ve read this blog for any amount of time you know that means Tour de France fever! Yes, I’ve once again got a hand in organizing the international knitalong (we’re over on Ravelry and we’re happy to welcome latecomers for a few more days if you’d like to join us). My friends and relations find this somewhat hilarious and/or bemusing, I think. Maybe it’s the fact that there are nearly eighty other fruit bats out there from Australia to Holland who love to watch cycling and knit at the same time and then talk about it on the internet. In years past I’ve taken on a really big challenge for the 21 days of the Tour, most recently designing and knitting Footlights and Daisy Daisy. I shall call it the Lanterne Rouge romper. (The Lanterne Rouge is the guy who finishes dead last in the Tour. Now do you get it?) 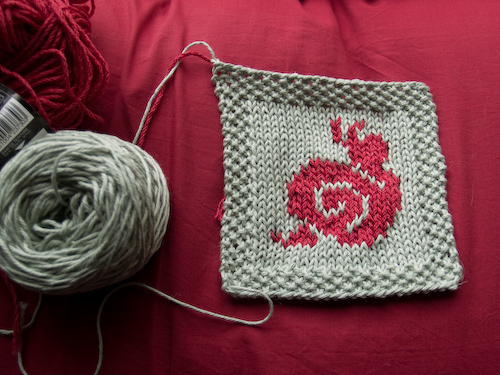 Cute snailie isn’t mine; I borrowed his chart from Adrian Bizilia’s wonderful Norwegian Snail Mittens (in Clara Parkes’s The Knitter’s Book of Yarn) and modified it just a touch since it doesn’t need to fit on a mitten. In addition to nodding to the Tour, this snail is a sort of “if you can’t beat ’em, join ’em” tribute to the soggy summer we’re having. His less adorable and far more voracious brethren have left my hostas in tatters. Tomorrow morning I get to cast on! Since the powers that organize world sports have seen fit to schedule the Tour prologue at the same time as the Argentina-Germany soccer match, there may be a bit of squabbling over the remote, and I’ll probably have to go back and watch both events in full later in the day. Good thing the weather outside isn’t tempting. I love that romper…and the little snail will be perfect!!! WOW!! 5 1/2 weeks to go, that’s so soon. This Auntie-to-be has her needles all ready for ya….project is being cast on next week. So cute! What a lucky little baby you’re brewing. For once it is *not* raining here and we are having true Tour weather. Chris went out to ride a long ride this morning with his friends in 90+ degree heat. Good times, right?! Best of luck with the KAL and your projects. I wanted to join too, but I’m so busy that I can’t breathe right now, and I think I would end up frustrated, beyond Lantern Rouge with my skirt. Have fun!! Wow! 5-1/2 weeks to go??? And the snail is so cute! I, too, am wearing shorts out of stubborness. It is JULY darn it! Although we are about to get hit with a heat wave and we will all be wishing for cloud cover! Let the Minnow countdown begin! Love the snail! And what a pretty swatch you made! I was thrilled to be heading back to work for some needed air conditioning (normally something I dislike – air conditioning). In Boston it was over 90 all weekend long!